NOVEMBER 2018 I DESIGN007 MAGAZINE 55 These three relationships can be seen in Figure 2. The results apply for internal traces in the middle of the board. Another question is, "What happens to the relationship for traces closer to an outside layer (i.e., not in the mid - dle of the board)?" It seems intuitive that the difference between the internal and external temperature change is greatest at the middle of the board, and lessens somewhat as the inter- nal trace gets closer to the external layers. 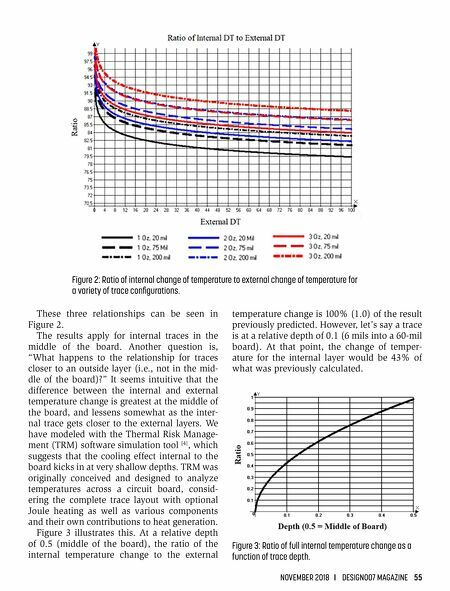 We have modeled with the Thermal Risk Manage- ment (TRM) software simulation tool  , which suggests that the cooling effect internal to the board kicks in at very shallow depths. TRM was originally conceived and designed to analyze temperatures across a circuit board, consid - ering the complete trace layout with optional Joule heating as well as various components and their own contributions to heat generation. Figure 3 illustrates this. 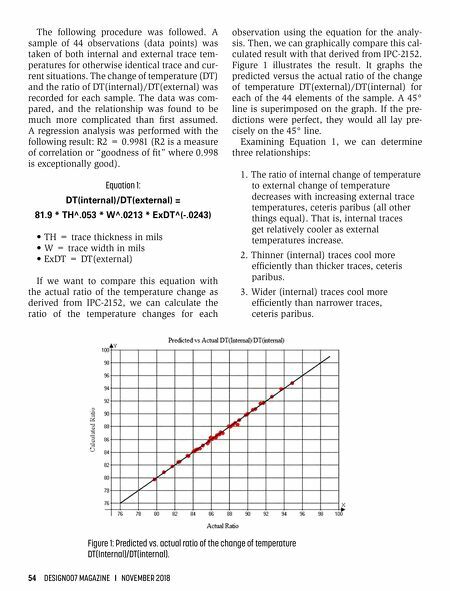 At a relative depth of 0.5 (middle of the board), the ratio of the internal temperature change to the external temperature change is 100% (1.0) of the result previously predicted. However, let's say a trace is at a relative depth of 0.1 (6 mils into a 60-mil board). At that point, the change of temper- ature for the internal layer would be 43% of what was previously calculated. Figure 3: Ratio of full internal temperature change as a function of trace depth. Figure 2: Ratio of internal change of temperature to external change of temperature for a variety of trace configurations.